REDMOND, WA (April 3, 2014): Paizo Inc., publisher of the world’s best-selling Pathfinder Roleplaying Game, as well as novels, game accessories, board games, and the wildly popular Pathfinder Adventure Card Game, is pleased to welcome the addition of Developer Owen K.C. Stephens to the Paizo design team. A lifelong gamer, Owen K.C. Stephens began writing articles for Dragon Magazine in 1990, in the hopes of making enough money to pay for his RPG habit. In the decades since, his career has included work for Adventure-A-Week, Green Ronin, Steve Jackson Games, Super Genius Games, White Wolf, Wizards of the Coast, and Paizo. Stephens will join Paizo to helm the development of the quarterly, 64-page Pathfinder Module line, working with both established Pathfinder authors and RPG Superstar winners. The Pathfinder Roleplaying Game is the world’s best-selling tabletop RPG, in which players take on the role of brave adventurers fighting to survive in a world beset by magic and evil. The Pathfinder RPG is currently translated into multiple languages, and the vibrant Pathfinder universe has been licensed for comic book series, graphic novels, miniatures, plush toys, apparel, and is being developed into a massively multiplayer online roleplaying game. //greenronin.com/wp-content/uploads/2017/07/RoninBanner-1.png 0 0 Evan Sass //greenronin.com/wp-content/uploads/2017/07/RoninBanner-1.png Evan Sass2014-04-03 16:27:432015-07-09 16:38:40Congratulations, Owen! 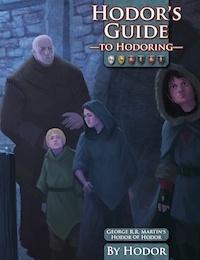 Hodor’s Guide to Hodoring (PDF) Ronin Round Table: Convention Season!